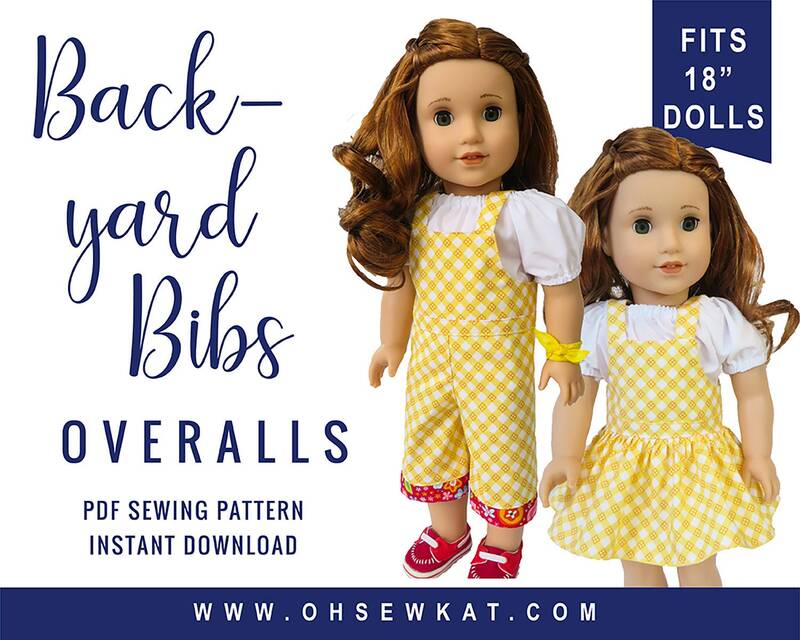 This listing is for a digital doll clothes overalls/ shortalls/ romper sewing pattern that fits 18 inch dolls. Your doll will be ready for the farm, the school yard and the back yard in her country cute Backyard Bibs overall with four variations. Add a fun pocket and layer it over an easy to sew Playtime Peasant Top to complete the look. The Playtime Peasant Top is the perfect shirt/top to wear underneath the Backyard Bibs. Find it for 18" dolls here: https://www.etsy.com/listing/491573607/doll-clothes-pattern-fits-18-dolls-like?ref=shop_home_feat_3. Your instant download file will include full color photos, full sized, computer drawn, pattern pieces and directions. Just print and sew! If you run into trouble, I'm only an email away at ohsewkat [!at] gmail.com. This listing is for the digital file PDF pattern. There are no refunds or returns on digital products per Etsy policy. No physical product will be mailed. This pattern was specifically designed and tested on 18 inch dolls such as American Girl ®. Oh Sew Kat! is not affiliated with American Girl®; no endorsement is implied. My dolls have a waist measurement average of 10 1/2 inches. Please measure and test the fit on your own doll as there are many on the market and it may not fit the same on all of them. Love this pattern, can't stop making it!